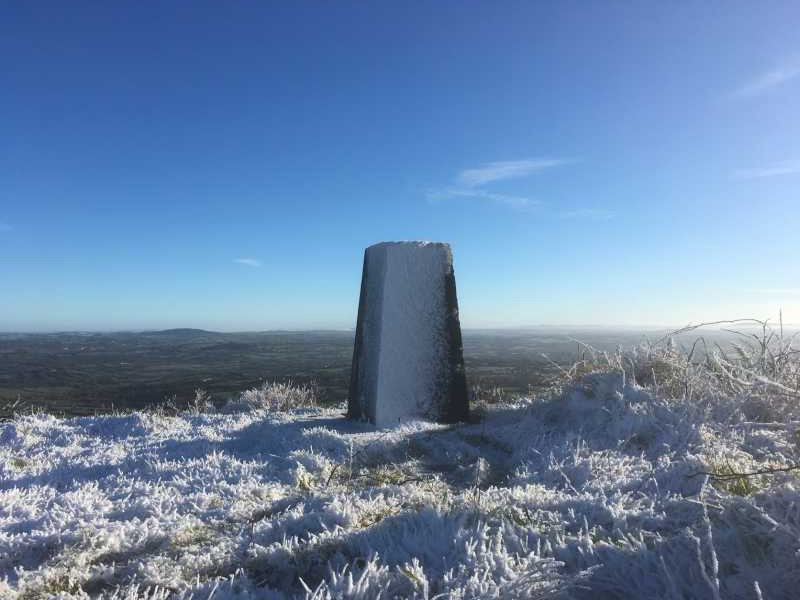 Picture from bryanmccabe : The only patch of nice ground is around the trig pillar! Picture: The only patch of nice ground is around the trig pillar! One visit is one too many! I'm with Geo on this one - Bruse Hill is a truly awful spot. I followed a route to the summit similar to Norbert's route, as the track (starting beyond the gate at the back of the graveyard, heading along the quarry edge) referred to in older posts is well and truly overgrown. Once I crossed the gate from the side road into the field, I headed for where the hazel wood was thinnest, pushed through it and then through awkward up to knee-high burned gorse (present everywhere above woodland level) to the trig pillar. This took about 30 mins. In my wisdom, I thought I'd head for farmland routing west of the quarry on my descent. Bad call! Rough ground, impenetrable gorse and high briars everywhere. I tried to punch through in a few different places, drifting increasingly west, but just got myself into awkward spots every time, with no easy way forward. Conscious of short December days, I eventually gave up and returned to the summit. From there, I couldn't identify from above where the thinnest part of the wood was, so having had enough interaction with vegetation for one day, I ended up contouring along the top of the wood to the east, where eventually there were enough gaps in the vegetation to zig-zag down to the side road. Total descent time to the side road (since my first visit to the trig pillar): 1 hr 15 mins. Much more of a workout than I expected. Needless to say, I won't be back!